Next month will mark the 4th year anniversary with my loving and beautiful wife Anne. Since then, I have developed an obsession with craft beer and she has developed quite the patience and tolerance. Unquestionably, one of the hottest topics that must be dealt with when planning a wedding reception is what alcohol (if any) to serve and how much to buy. Your budget and moral beliefs should play a major role in that decision. Typically, your caterer will run your bar. Most provide everything from glassware, bartenders, and nonalcoholic drinks to mix with the spirits. What they serve, however, is negotiable; as is the amount you'll spend. We had an open wine and beer bar at our reception, no liquor. If one goes to a wedding and there is wine being served, the choice most often is simply "red or white." Why can't there be a choice for beer, "ale or lager?" People don't abstain from drinking wine because it's not specifically Caymus or Chateau Guiraud ; they're there for the event, and the occasion, and they're going to drink what's presented to them. Beer is easier to splurge on than wine and will allow for a bit of spark and uniqueness to your reception. 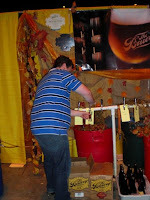 Your wedding planner should be versed on beer as much as they are versed on wine, but most aren't. Your wedding is probably the biggest party you and your spouse will ever throw, so don't skimp on the beverage selection. Allow your guests to have a great time so they'll dance and stay longer...and refuel to do the 'worm' on the dancefloor. PS - Rethink about the buying the wedding beer koozie. Nobody wants to stand around at parties, post-reception and drink beer out of a koozie emblazoned with the slogan "Love Is All Around" or "Love Nick and Jessica 4-Ever." A friend of mine, Tyler Coco has quite the affinity for these stubby, personalized insulators with a collection of roughly 30 wedding koozies. 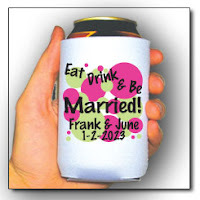 Email me pictures of your favorite/hilarious wedding koozie. When ordering a Lone Star bottle, ask for the cap – underneath is a picture puzzle, which may spark conversation or simply allow you to waste time instead of watching little kids dance with all the best looking ladies. The 1.5” white foam quickly disappears from the transparent, pale yellow liquid. At first draw, Lone Star brings strange aromas of processed canned chicken broth, corn adjuncts, and wet grain sack…better drink this from the bottle. When the fizzy brew hits the lips, alcohol is most prominent with a slight metallic tinge which allows flavors of purple grape peel, canned cream corn, and bran cereal to dominate - zero hop profile. Thin carbonation somewhat creamy from the adjuncts. If I was at a bar and they had $1 Lone Star (Thursday's at Pacesetter), I could drink a few of these – from the bottle. Now I understand why I never thought to sample Lone Star from a pint glass before this review. The saving grace of this beer is the price and ultimately the picture puzzles beneath each cap. See below and try to figure out each puzzle. Lone Star winning 2 gold medals at GABF is beyond me. Pronounced ‘WHO-Garden,’ this Belgian White Ale can be consumed quickly – chugged. Pierre Celis, famous for brewing the first batch of Hoegaarden beer in 1966 in Belgium, founded the Celis Brewery in Austin Texas, which was bought out by Miller in 2001. The rich frothy collar rests atop the yellowish cloudy brew and suggests a white aurora towards the bottom of the pint glass. Aromas are reminiscent of orange Creamsicle, coriander, and some faint Big League Chew original bubblegum in the back. Citrus (lemon and orange) flavors, pale wheat, clove, and a clean hop profile to create a wonderful and refreshing beer, perfect for a wedding or a day in the backyard with friends. Trappist monks devout their entire life to the service of God and abandon all their possessions, making a vow of poverty, while splitting their time between prayer, charity, and manual work - that for some, include beer. Monks have always lived self sufficient - cultivating the land, making their own bread, butter, and cheese and in the northern European countries brewing their own beer. The monasteries are a place of study where monks have time to hone in the art of beer and cheese making - it was only until recent did the abbeys install ultra modern technologies to the service the monks' long brewing tradition. These Trappist workers produce a few styles all of which are what brewers call ''bottle conditioned,'' meaning that a small dose of sugar and yeast is added to each bottle just before it is sealed. Of the 171 Trappist monestaries only 7 today produce beer (Achel, Chimay, Koningshoeven, Orval, Rochefort, Westmalle, & Westvleteren) - and of these 7 only 3 are available in Texas: Chimay, Orval, and Westmalle. The most exclusive and rare of all Trappist breweries is the Brouwerij Westvleteren from the St. Sixtus Abbey (pictured), in the West Flanders region of Belgium, who produce a beer Abt 12 that many consider to be the world's best beer. The Westy bottlehas no label but sometimes has an embossed collar on the neck. The cap helps distinguish Westys. 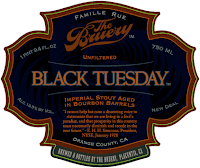 This beer alone has created a black market because of the ultra limited supply/distribution, insane demand, all coupled with the Monk's strict moral code that 'the beer is not to be commercialized.' In order to buy this beer, one must first place an order weeks in advance, travel to the St. Sixtus Abbey's drive up service station - typically waiting in very long lines, and finally are rationed out only a few cases per vehicle. The price of a case (4 six-packs) at the abbey typically run $48 but I have seen a single six pack on eBay run $170. Expensive? Well, yes - but remember, it is typically only the globetrotting millionaire who can afford one bottle of some of the world's best wine, which can start in the upper hundreds, if not thousands of dollars. I've seen friends and family not blink to a bottle of simple Dom Perignon (by the way who was a French monk) for $200+.I traded for the above pictured Westy 12s through BeerAdvocate.com. This is a wonderful way to get beers that you cannot get and to allow others to try local favorites that you are more easily able to acquire. Mark polishing off a 6 year old Westvletern 12 that he was gracious enough to allow me to sample. The Notre-Dame d'Orval / Brasserie d’Orval S.A. Pours extremely hazed orange-copper, with a fluffy head letting convoluted aromas of rose hips, chamomile, granny smith apple, leather, and burlap sack. Flavors of wet hay, orange blossom water, lemongrass, petals, some wood, and a slice of hop bitterness towards the back – accumulating to a lingering body and light carbonation. 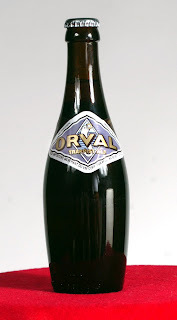 Orval can challenge the craft beer neophyte, but guarantees to remain etched in your memory as one of the most unique experiences one can have with brew. Hazy orange color with frothy foam that falls to a beautiful lace. Nose is orange slice jelly candy, lemon zest, pear flesh, grass, and pink peppercorn. There’s a nice yeast spice, green apple, vanilla on the palate along with an open airy carbonation. Westmalle Triple is a very complex beer and as it warms brings a breadiness, pepper again, herbal notes, then the treasured candied sugar - crisp finish. Ultimately, a world-class beverage. It was only until recently that I have come to treasure the intense and colorful depths of barley wine (barleywine). Despite its name, barley wine is no doubt a beer, albeit, a very brawny style, originally made by the English aristocracy who designed it to age, some up to 20 years. It did not arrive to the general public until around the late 1800s because it was much too expensive for a brewery to produce on a commercial scale. Many English brewers had quite the affinity towards French vintners and this led them to create a style of strong ale, so named because many versions had a high alcohol content comparable to wines (8%-14%) of the same period. What transpired was a beverage that featured a big malt, fruity character with a sugary backdrop that warms like a fine sherry or tawny port. Garrett Oliver, brewmaster of Brooklyn Brewery describes the aroma of a 1992 Thomas Hardy (pictured is a 2007 & 1986) as "so beautiful that it makes me want to cry. It contains universes." Stumped for words at the moment, Oliver reaches for comparisons to ‘oranges, raisins, plums, wildflowers, basil, old leather, freshly chopped wood, fallen leaves, black truffles.’ Unfortunately, there is not a single English imported barley wine available in Texas. With the rise of American brewing ingenuity, barley wine has taken on new heights with a much stronger hop addition than its English counterpart. Adding more hops during the boil of brewing lends more bitterness and aroma when fresh and a deeper tropical fruit character when aged; I prefer most American barley wine fresh. Richly aged barley wines are a perfect accompaniment for Stilton blue cheese, while fresh, hoppy barely wines can compliment with the sharpness of a farmhouse Cheddar. Beer and cheese is simply the better pairing – forget about wine, unless it’s a barley wine. Pours garnet with dark brown hues and a frothy crown of ecru foam. Fragrances of grapefruit, spearmint, caramel, woody spice, dried orange peel, and juniper berry round the aroma. As the brew warms it releases a pungent, astringent aroma of orange hand soap (GOJO and Fast Orange come to mind), quite awkward and unpleasant. A surprisingly flat taste hits the palate with not much more than light caramel, a nice balanced hop bitterness, and some faint soy sauce in the far depths. This finishes thin, watery and almost bone dry, the fine carbonation holds it together. At times, this brew can be dangerously drinkable because the alcohol sits in the back, undetected. Not quite what I expected from one of my favorite Colorado brewers. Amber waves of grain adorn the engaging ruby hued brew with a crown of tan foam. Sugar cookie, caramel, bitter lemon and grapefruit, with intense pine oil hop profile blankets the nose. The taste is very strong of malt then slips into a lip-smacking juicy hoppiness, with citrus rind and a medium dry feel on the palate. When it warms, there is some rum, fruit cake, raisins, and honey in the aroma. After a few sips, the sticky lace clings to the glass beautifully. 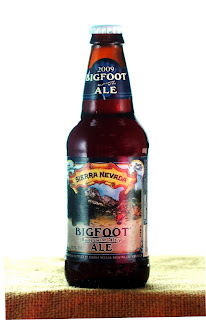 Bigfoot could age beautifully for 2-5 years, but why wait - grab it now and save a couple for later. I really love this beer! 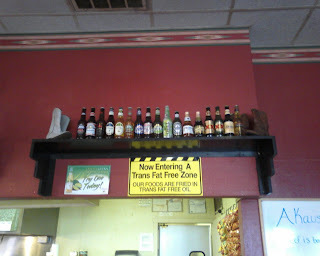 The next time you’re at a bar or restaurant, notice the ‘beer menu’ and you’ll see 8-12 bottles displayed on a shelf that resembles a college freshman’s boastful brand display of binge drinking. These bottles may have shinny labels, be in green or clear glass, stuffed with adjunct grains, reign from USA, Mexico or Europe but are all the same brew - the American Adjunct/Light Lager. Brews made with adjuncts like corn, rice, and cheap cereal grains cut flavor and costs, all developed for mass-production and consumption. These tiny 12 oz form-fitted mass marketed pieces are built by large, macro companies who have a fractionalized portfolio that include different variations of the same style - many of whom will have their own $3 million spot during the Super Bowl. We want real - real beer created not for the voluminous bottom dollar, but for taste and pure enjoyment, for just a few quarters more. It is important to notice that there are people creating products by hand with much attention to creativity, quality and craftsmanship that attract a small segment of the market with a very scaled marketing budget. The craft beer business and movement is a segment that has been widely unaffected by the tumultuous economy. Kickoff this bowl season and host your own Brew Bowl. For NCAA bowl games or Super Bowl, try to pick some brews from each participating city/region or something from the host city. If the city match up happens not to be in beers favor, like this year’s BCS National Championship between Oklahoma vs Florida in Tampa Bay or the Super Bowl in Miami then we must move to plan B. Another idea is to have a beer cooking throwdown - beer brats, beer bread, or the below recipe for a Brew Con Queso. In a bowl toss the cheeses with the flour and reserve the mixture. In a large heavy saucepan cook the onion with the butter over low heat, stirring, until it is softened and clear (do not burn), add the beer, the can of Rotel, and the peppers (jalapeño), and simmer the mixture for 5 minutes. Add the reserved cheese mixture by 1/2 cupfuls to the beer mixture, stirring after each addition until the cheeses are melted, serve the dip with the chips. Kölsch is an interesting and rare style, as it is like a hybrid of a lager and an ale, reining from Cologne, Germany. Lawnmower is fermented using an ale yeast and is lagered, which means that it is cold-conditioned at lower temperatures (around 35° F) which in this case will lend a bit of sweet complexity with the ale yeast, yet will be quite crisp and mild with a lighter color. Lawnmower pours fizzy yellow with a dissipating crown of foam which smells of biscuity malt and slight purple grape with a fine hop accent. Taste parallels the aroma but with an additional hoppy lemon kiss at the end. Wow, this is one drinkable brew and the clean, crisp carbonation lends a fantastic mouthfeel. 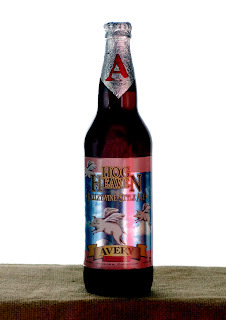 This brew won a gold medal at the 2007 Great American Beer Festival and two previous bronze medals in the same category. Try Fancy Lawnmower with the lobster quesadillas at Easy’s. This is by far my favorite Mexican beer. When I’m craving Tex-Mex, I typically head to Carmella’s in Beaumont because they have this brew .... and some of the best chicken fajitas and guacamole. Spicy foods and alcohol simply don’t mix too well together because the alcohol acts as magnifying agent to the heat. When you choose a beer while eating heat, pick one with lower alcohol content - but please don’t forget flavor. Fats help to calm the fire and this is why I typically order guacamole or queso with the chips and hot sauce when drinking. Bohemia is light golden in color with decent head retention yet little lacing. Fantastic light floral and herbal hop aroma that you don’t get in most Mexican brewed lagers. Taste brings sweet malts, clear balance, and a clean finish with a considerate bitterness. Bohemia is a fantastic substitute for the American Adjunct Lager. We see thousands of branding messages a week - how do these few spots grow roots through our saturated consumer minds? It’s bit unsettling for me that AB sold out to InBev because it quickly untied a thread of our American culture. By the way, Anheuser-Busch InBev just cut 1400 jobs, 6% of their total workforce just week after their $53 billion takeover - an insight of what’s to come. 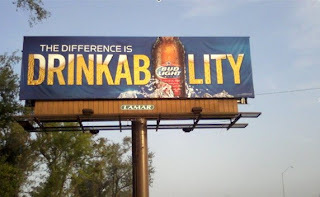 Drinkability is simply gauged by a simple question, 'Could I drink another one of these?' No thanks AB-IB! I truly believe America has the best beer in the world - drink American craft beer and support your local breweries. Craft beer is a beverage that costs about the same as something like Bud Light and it provides less 'risky' opportunities to try than say a craft wine. Consume something that has creative stature and simply tastes better. Peeking up from a Christmas dinner prayer, I glance around the long table where family and friends have their heads intently bowed, eyes closed - each accompanied by a bounty of food and drink. Muted colors of informally portioned food: Candied pecan yams, squash soup, peppered cranberry turkey, cinnamon spiral ham, cornbread dressing, and fresh snap green beans, all pop with color when placed on the white China. Resting at both ends of the table are two carafes of wine that play only a small part in the beverage vehicles that await each guest. Yet, with five to seven other drink offerings... no beer. How did this happen? Where did beer get lost in the mix of forgetful gifts that many perceive as unseeingly gracious and unflattering as fruitcake? Reflecting, ‘I will not let this happen next year,’ I conjure how one could impress and wow a dinner table with new conversation, but without the pretentious perception of expensive wine. Bring beer! Beer also has its ostentatious crusaders. I meet too many self-proclaimed, ‘beer snobs.’ This moniker alone is averse to spreading the goodwill of good beer. Do not be a beer snob, as it will only intimidate potential brew advocates and not allow them the open-mindedness to simply have fun. That being said, beer deserves respect at the dinner table. During the holidays, people expect to try an abundance of items that in turn gives you a great opportunity to show your peers how to move beyond the wine list. Connect food with beer and create memories your guests may never forget. When guests arrive, open up conversation without a palate overkill with lighter brews like Victory Prima Pils or Sam Adams Boston Lager. Next, pair up salads and cheeses with pale ales like Sierra Nevada Pale Ale, Saint Arnold Elissa India Pale Ale, or Dogfish Head 60 minute. Moving to dinner, think of beer as being the best thing to drink because wine in many cases is too acidic. Think of brew having 3 C’s - It cuts fat and starches with it’s carbonation which literally scrubs your tongue and opens up the next bite. Beer also compliments many flavors like sweet, citrus sour, smoky, and then can contrast like bitter, salty, and sweet. With dinner try substituting wine for brew...or at least have it available. Replace a bright chardonnay or white with a Farmhouse Saison like Dupont or my favorite, Ommegang Hennepin which yields great carbonation and an earthy, citrus flavor profile to go well with turkey and cranberries or candied yams. Other Belgian style beers like strong dark ales, dubbles, and quadruples like Chimay Red and Blue or the reviewed St. Bernardus Abt 12 can help lift foods like roasted pork loin, spiral ham, and stuffing. So what for dessert? Brownies, truffles, chocolate, and ice cream can all go well with brews like Lindemans Framboise or Kriek (raspberry or cherry beer) or especially darker stouts like Young’s Double Chocolate Stout or Bear Republic Big Bear Black Stout. Finally, don’t forget about seasonal beer. Try Shiner Holiday Cheer, that is brewed with pecans and Stonewall Peaches or my winter favorite, Anchor Our Special Christmas Ale. In addition to the fantastic pairings of beer and food, all the brews suggested are crafted suitably outside as well as inside to offer attractive table appearance, some of which are corked and caged like a Champagne bottle. Be the considerate gourmand at your next holiday dinner or party in which beer can be your way to revitalize the bountifulness this season. St. Bernardus Abt 12 is a Quadruple that reigns from Belgium and is brewed by Trappist monks in the small region of Flanders. Much of the proceeds from the beer are collected to sustain their livelihood and local charities. Color is dark pomegranate and brown hues with unbleached linen color foam that dissipates rather swiftly but leaves a wonderful ring. Caramel malt, apple, plum, and sugary molasses dance in the aroma. Sipping the brew brings a lace of candi (rock) sugar to the lips while pear, caramel, dark fruit, cinnamon, and a slight bitterness to the palate. Some prefer to have Abt 12 after a meal or with a cigar but I think with such a developed and complex flavor profile and carbonation this would also be perfect for those hearty and savory dishes we have come to love this holiday season. Instead of Champagne at New Years Eve, bring St. Bernardus Abt 12. Seriously, $10 is remarkable for one of the world’s best brews - do yourself a favor, buy it now. I have a soft spot for Sierra Nevada Pale Ale as it was the first real beer experience that opened my senses to something completely new. What I remember was that it lasted like grass and piney bitterness, yet sweet and...I wanted more. Pours golden amber with a tight beige head that falls to a nice lace. Nose is pine with biscuty malt then follows to a slight citrus. Hops are spicy, fruity, and floral while the Cascade bitterness lasts throughout the tasting to the back of the throat with easy carbonation. So many flavors in this brew and is so drinkable. Local bars and restaurants listen up - get this in your beer portfolio now and replace one of those seven macro lagers with this instant classic! Why is this only available at two local bars/restaurants?